Da Capo Lifelong Books, 9780738213224, 208pp. Despite the abundance of parenting primers, no single book helped expectant parents focus on a key player in the processthe developing baby itselfuntil now. Postcards from the Bump teaches parents to recognize the many cues babies give about their burgeoning personalities and what they'll be like once they've entered the world. Here are true stories from moms, helpful tips, and how-to'sfrom dressing your bump to planning a babymoon” to learning what those cravings meanas well as simple, indulgent recipes like Gingerbread Patty Cakes” and Dark Cluster Love Bars.” The perfect gift for the mommy-to-be, Postcards from the Bump takes the focus off the hardships, fears, and pounds of pregnancy and places it firmly on the babies. 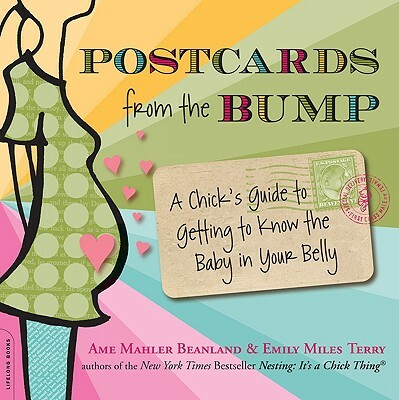 Ame Mahler Beanland and Emily Miles Terry are columnists and the New York Times bestselling co-authors of It's a Chick Thing® and Nesting, which have sold over 175,000 copies combined. They live in Texas and Massachusetts, respectively.